Many myths surround Julia Morgan’s career, but one of the most persistent is the legend that she destroyed the records of her nearly fifty-year practice when she retired in 1951. In fact, Morgan carefully preserved thousands of architectural plans, drawings, sketchbooks, photographs, correspondence, project files, and other personal and professional papers, which were given to California Polytechnic State University by her heirs in 1980. 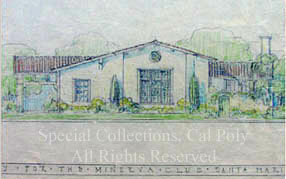 Generous donors have made several other significant gifts of Morgan materials to the Kennedy Library, including plans and sketches for residential and business commissions, and the research files of the late architectural historian, Sara Holmes Boutelle, who wrote the first book-length biography of the architect. Together these gifts represent the largest and most comprehensive Julia Morgan archives in the country, containing unique and original materials on her Beaux-Arts education in Paris; her participation in the influential Arts and Crafts movement in early twentieth-century California; project files and drawings of her commissions for influential women and women’s organizations; and extensive records relating to her masterworks, the seaside retreat, Asilomar, built for the Young Women’s Christian Association (YWCA), and the legendary estates at San Simeon and Wyntoon for publisher W.R. Hearst. Learn more about the Morgan-related collections. In 1904, Julia Morgan became the first woman licensed to practice architecture in California. A successful and prolific architect during the first half of the twentieth century, Morgan was born in San Francisco in 1872 and educated at the University of California at Berkeley and L’École des Beaux-Arts in Paris. Her trailblazing career helped open the field of architecture to women in the United States. Today she is perhaps best known for the design and construction of publisher W.R. Hearst’s legendary California coastal estate. Yet she was much more than the architect of San Simeon. Julia Morgan’s studio portrait, 1926. In 1951, she retired, closing her office in the Merchant’s Exchange Building in San Francisco and preserving documentary evidence of her long and distinguished career. Julia Morgan died in San Francisco at the age of 85. 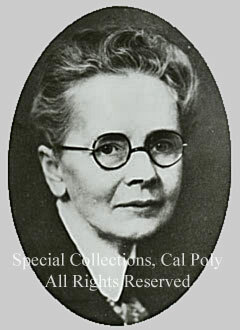 Gifted in mathematics and actively encouraged by her mother, Julia Morgan excelled as a scholar. Her mother’s cousin, Pierre Le Brun, who designed the Metropolitan Life Insurance Tower, an early New York skyscraper, kindled her interest in architecture. In 1890, she enrolled in the undergraduate civil engineering program at the University of California at Berkeley, because there were no architectural schools on the West Coast at that time. During her senior year at Berkeley, a technical drawing class provided her with a mentor, architect Bernard Maybeck, who encouraged Morgan to move to Paris to attend his alma mater, L’École Nationale et Spéciale des Beaux-Arts. 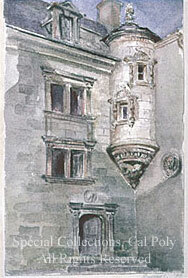 Under the French system, students were accepted into anatelier, or studio, of a Beaux-Arts-trained architect. Once past the highly competitive entrance exams, students were assigned a succession of programmes: a suite of rooms in a grand apartment of a palace, art galleries, opera houses, and other opulent environments fit for lavish, if imaginary, clients. Students were trained to produce beautiful drawings and detailing quickly, without much emphasis on real context, such as site considerations. The faculty relented and Morgan was admitted to the program and secured a place in the atelier of Grand Prix de Rome winning architect-instructor Bernard Chaussemiche. Impressed with her perseverance, California philanthropist Phoebe Hearst offered to underwrite her education in Paris. Morgan declined the offer of funds but conveyed her gratitude for Hearst’s support. Morgan advanced to the first class in less than half the average time. In her free time, she traveled throughout Europe, filling sketchbook after sketchbook with accomplished watercolors, pastels, and line drawings. In 1902, after winning honors for her work in mathematics, architecture, and design, Julia Morgan became the first woman to receive Beaux-Arts certification in architecture. With dîplome in hand, Morgan returned to Oakland in 1902 and joined the practice of John Galen Howard, who had opened an office in Berkeley after winning the master building plan competition for the University of California. 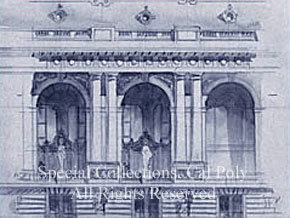 Morgan drew the elevations and designed the decorative details for the George Hearst Mining Building and the Greek Theater on the Berkeley campus. Morgan’s temporary office after 1906 SF Earthquake and fire. Disbelieving, the reporter then sought out Morgan to ask about her work as an interior decorator. “Structural!” The word pegged my imagination down to earth again. For in the back of my mind I had been wondering whether architecture is not a fine field for any woman with a sensitive feeling for color and form. But “structural” conjured up a vision of strength of material and all sorts of problems, which no amount of sensitive feeling would solve. The successful Fairmont project led to other clients, including many residential commissions in the Piedmont, Claremont and Berkeley neighborhoods, and an early triumph, St. John’s Presbyterian Church in Berkeley. Grace Merriam Fisher, a Berkeley sorority sister of Morgan’s, recommended Morgan as architect for the Oakland YWCA building in 1912. The next year, Morgan began work on a series of buildings in the Arts & Crafts style for Asilomar, a seaside YWCA complex near Monterey endowed by Phoebe Hearst. Host to thousands of visitors since its founding in 1913, Asilomar is now a state park and conference center. Morgan eventually designed 28 YWCA buildings in fifteen cities, including the Honolulu YWCA and the Chinese and Japanese YWCA buildings in San Francisco. In April of 1919, Julia Morgan and her client, William Randolph Hearst, met in her San Francisco office to begin the design and planning for San Simeon. 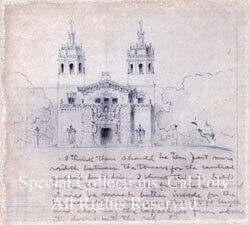 After much deliberation and consultation of their respective voluminous libraries of architectural books, Morgan produced sketches favoring the Spanish Colonial architecture that characterized the 1915 expositions in San Francisco and San Diego, elaborations of the Mission Revival style popular in California for the previous 25 years. But Hearst was also quick to note that he “wished for something a little different from what other people are doing in California,” which ultimately led to the mingling of styles and periods that is San Simeon. Morgan’s classical Beaux-Arts training, joined with her engineering degree and expertise with reinforced concrete, made her the ideal architect for this demanding commission, which absorbed both architect and client from 1919 until the mid-1940s. Incredibly, there were times when Hearst’s mammoth warehouses failed him and it was necessary to make reproductions of the art, furniture or ornamentation they envisioned for a particular room. Here Morgan also excelled, for she had contacts abroad to locate the artisans skilled in wood, iron, tile, stone and glass. In addition to the construction on the seaside hilltop at San Simeon, in the late 1920s Hearst commissioned Morgan to design and build a (relatively) small hacienda near the northern boundaries of his ranch. Located near the tiny settlement of Jolon, the Milpitas Hacienda was built to house cowboys, but also served as an oasis for Hearst and the visitors who accompanied him on strenuous horseback tours of his sprawling ranch. To keep the newspaper mogul in touch with his many enterprises, a telephone line was strung along the 36 cowboy camps of the ranch all the way to Jolon, thirty rugged brushand-rattlesnake-filled miles distant from La Casa Grande. Less than a mile from Morgan’s Milpitas hacienda is the Mission San Antonio de Padua. The Mission had been in a state of disrepair following the secularization of the missions, and completely abandoned after 1882. Phoebe Hearst and her son both contributed to the restoration of the historic structure when the drive to preserve California’s twenty-one missions became a popular effort at the turn of the twentieth century. In the early 1940s, a great deal of this acreage, including the Milpitas Hacienda, was sold to the U.S. Army, for a training facility called Fort Hunter-Liggett. The Minerva Club was first organized in 1894 as the Ladies’ Literary Society of Santa Maria, whose members gathered to discuss literature and raise money for a circulating library. The organization was instrumental in incorporating Santa Maria as a city in 1905, so that philanthropist Andrew Carnegie would honor their request for funds to build a town library. The public library opened four years later, enriched with funds and books donated by the group that had renamed itself in honor of founding member Minerva Thornburgh. After a lot at Lincoln and Boone streets was donated by the Goodwin family for a permanent clubhouse, the Minerva Club contacted Julia Morgan, who had been recommended by a Santa Barbara friend. Morgan submitted two different plans for the clubhouse, for which she was paid $630. 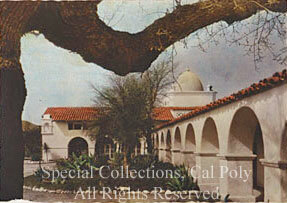 Construction began in June of 1928, with a gala open house upon completion that October. The Minerva Club building features custom-designed ceramic tiles for the fireplace, exposed hardwood ceiling trusses, lavish use of natural wood for the interiors, and terra cotta urns at the front entrance. Minerva Club members raise scholarship money for students at Hancock Community College and still meet in their custom-designed clubhouse, which was placed on National Register of Historic Places in 1984. On November 17, 1924 two small women’s organizations in San Luis Obispo, a book club and a home cultural club, met and decided to unite to form a new organization that would promote cultural and social welfare in San Luis Obispo. The 26 members present at the meeting agreed to serve as charter members of the new club. 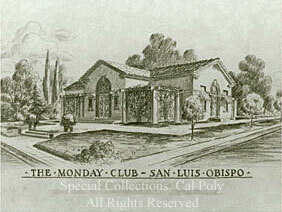 On September 14, 1925, the Monday Club began its first complete club year. Interest in the Monday Club grew rapidly and by 1928, with a paid membership of 350, club members recognized the need for a clubhouse of their own. Miss Grace Barneberg, Monday Club president from 1926-1928, was impressed by the YWCAs and women’s clubhouses Julia Morgan had designed in the Bay Area. Barneberg recommended that the board contact the San Francisco architect, who was often in the area as she worked on William Randolph Hearst’s San Simeon Ranch. Steve Zegar, who regularly drove Morgan back and forth from the train station in San Luis Obispo to San Simeon, introduced the two women. Morgan inspected the lot on Monterey Street that the board had purchased and consented to design a clubhouse without charge, in return for Monday Club members arranging her room and board when she came to San Luis Obispo. The club ladies were delighted to help and took turns welcoming Miss Morgan into their homes. The Monday Club is an accomplished building in the Arts and Crafts style, with the attention to detail typical of Morgan’s work. The interior was designed to suggest a garden gazebo, with an awning over the stage area and light fixtures resembling Chinese lanterns. Fond of the loquat trees that grew near the site, Morgan retained San Francisco painter Doris Day to include them in her murals for the main hall. The clubhouse was dedicated on May 11, 1934. Monday Club members continue to advance the goals of the founders, to enhance the educational, civic, social and cultural quality of the San Luis Obispo community. 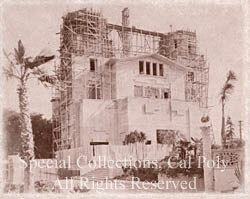 Julia Morgan often worked behind the scenes at San Simeon. Far from the glamour of La Casa Grande with its objets d’art and famous guests, Morgan directed members of her staff and Hearst employees in the day-to-day construction and operation of the vast estate. In the village of San Simeon, Morgan designed and constructed five unique houses in the Mediterranean style for the estate’s senior staff and their families. Construction superintendent George Loorz, head gardener Nigel Keep, and maintenance head Marks Harry Eubanks lived in the Spanish-tiled stucco houses on the bay, while Don Pancho Estrada, descendent of the family who held the original Mexican land grants for San Simeon, lived in the house closest to the estate’s warehouses. Morgan consulted with each member of the workers’ families, including the children, before producing her designs. The fifth house, built nearby in the same Mediterranean vernacular, disguised the estate’s poultry ranch. 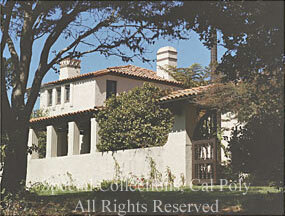 Julia Morgan calculated the cost of constructing the five staff houses at $110,000. The San Simeon village houses are private property and not open to the public. San Luis Obispo County is home to San Simeon, the greatest of Julia Morgan’s commissions. 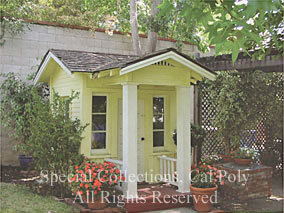 It is also the location of her smallest job, the enchanting playhouse Morgan designed and built for the daughters of Steve Zegar, the local taxi driver. Morgan continued a full-time practice from her San Francisco office, so she devoted most weekends during the 1920s to design and on-site supervision of construction at San Simeon. Morgan would leave her San Francisco office late on Friday afternoon to catch the coast train, sketching during the 200-mile trip to San Luis Obispo. Upon arrival, Morgan would dine on oyster stew and coffee near the station and then join Zegar for the journey up the coast. Their friendship was forged during the many trips they made back and forth over the years between the train station and the construction site on the hilltop nearly 45 miles away. According to its present owners, the playhouse was designed in 1925 on the back of a brown paper bag, as Zegar ferried his passenger up Highway 1. On other trips, Morgan made time to supervise construction and soon the Zegar girls were playing in a custom-designed Julia Morgan house right in their own backyard. Morgan ran her office in the atelier style she had learned at the Beaux-Arts, providing mentoring and training to young men and women who were intent on careers in architecture. Known as a demanding but fair employer, Morgan instituted a profit-sharing plan for every member of her firm, an unusual practice at the time. W.R. Hearst and Julia Morgan, San Simeon, c. 1921. Image courtesy of Bison Archives. Happy Wednesday! It's 7:20pm right now.